The first ever Two-Part Breakaway Stirrup to be made in such a revolutionary high-tech material, the Smartrider 'Escape' incorporates UV protection within it's design and can be produced in a vast array of colours. 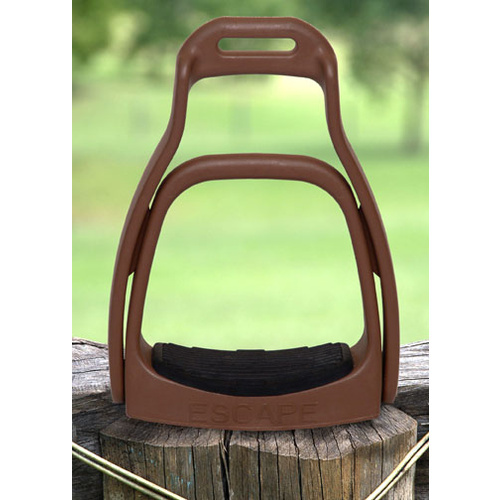 It also has the added ability, when tilted to a 180 degree angle to double as a ladder providing assistance when mounting your horse. 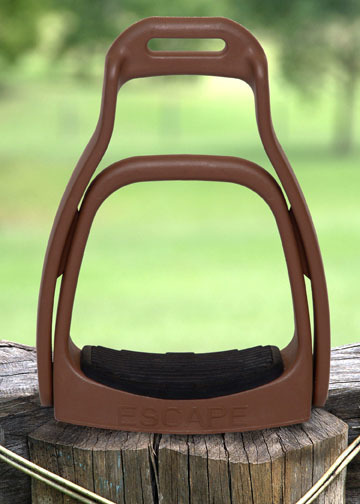 The SmartRider 'Escape' Breakaway Stirrups won't stop you from falling, but will allow you to enjoy the freedom of horse riding with the knowledge that if you do part company with you horse, you'll do just that! SmartRider 'Escape' Breakaway Stirrups come in a pair and the one width, 125 mm (5"). They would not be suitable for a small child. The different sizes relate to the customer's weight to allow for the correct release. 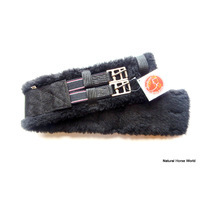 Read a comprehensive review of these stirrups here. WHAT A DRAG!!! Getting your foot entangled and caught up in the stirrup whilst horse riding and being dragged is EVERY riders worst nightmare!!! Countless deaths, serious debilitating and permanent injuries are unfortunately attributed in the worldwide arena to horse riding related dragging accidents!!! 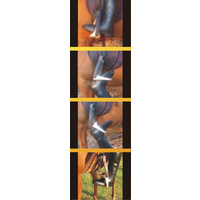 SmartRider Pty Ltd invents designs, develops and manufactures horse safety stirrups. For both English and Western style riders we have our 100% Australian, manufactured right here in the SmartRider 'Escape' Breakaway range. 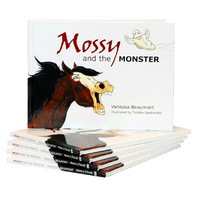 Every year in Australia alone, 28 people die from horse related accidents and over 3000 people annually suffer serious debilitating injuries. 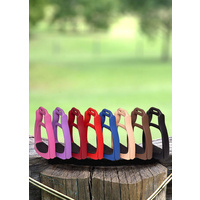 SmartRider Escape Breakaway Stirrups were specifically invented and designed for young riders, the future of our nation, who like to be trendy and to make safety more attractive for them. Our SmartRider Breakaway Stirrups SAVE LIVES!!!!! The first ever Two-Part Breakaway Stirrup to be made in such a revolutionary high-tech material, the Smartrider 'Escape' incorporates UV protection within it's design and is produced in a vast array of colours. 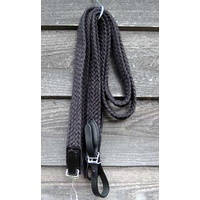 SmartRider 'Escape' Breakaway Stirrups come in a pair and the one width only, 125 mm (5"). They would not be suitable for a small child. 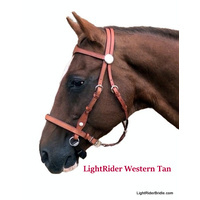 Fits stirrup leathers that are up to 4cm (1 1/2") wide in the small slot, or up to 6cm (2 1/2") wide (such as western or stock fenders) on the wider part of the neck. 12 month money back guarantee/return policy against manufacturing faults. These safety stirrups are so good in so many ways. Luckily I haven't had to test their ultimate job in the case of one's foot getting caught in the stirrup in the event of a nasty fall, but I have used them 2-3 times per trail ride in beautiful Burgundy in France to get back on my very tall Portuguese mare as I am only a diddy 5'1'! They flip down to give you a crucial extra 5-6" and then once back on, the stirrup clicks back onto position for it's safety role. They are made of a light but extremely durable plastic that I do prefer to the metal ones these replaced. All round I can highly recommend these. This is the second pair purchased. This first pair is for a western saddle and this pair is for my Amish saddle. I feel so much safer with breakaways. My 2 biggest fears on a horse are getting caught by a stirrup, or the horse tripping or falling down (has happened to me more than once). I never worry about getting caught anymore. Also, the bonus of being able to turn them upside down for mounting is great. Overall, peace of mind and lightweight on my saddle is well worth the purchase. I will have these on every saddle I ever own. I was very impressed with the speed of delivery too. Fantastic lightweight, safety stirrups. Very comfortable and I feel completely safe in them.